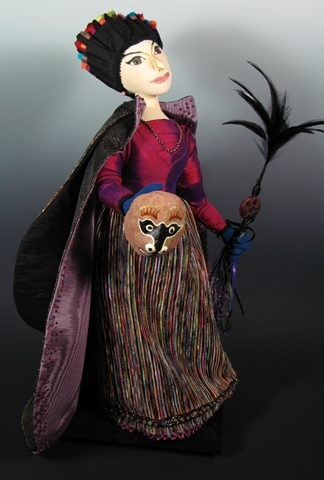 This doll was made in a Costuming course offered to ADU members by Adele Sciortino in the spring of 2008. 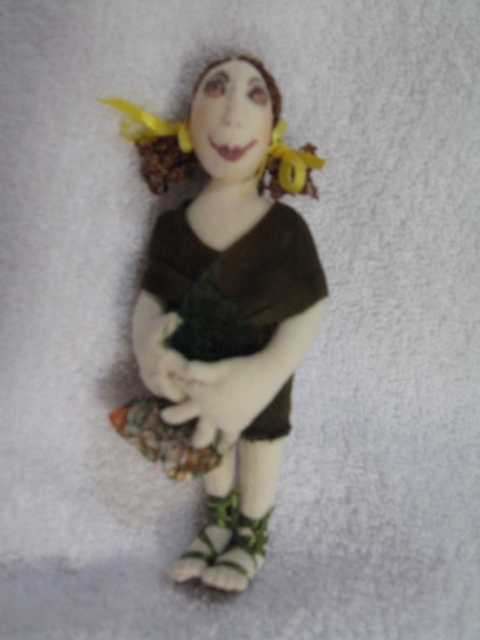 The doll is made from Adele's pattern. The costuming was inspired by the Chinese Hungry Ghost Festival. The “hungry ghosts” represent disembodied spirits of those who after their death did not receive “proper burial rights”; offerings of food, paper clothing, etc. which are traditionally burned at a funeral to provide the means to survive in the next world. Denied this respect, they are resentful and angry. The Hungry Ghosts Festival is designed to calm their anger and enable them to return peacefully to the underworld for another year. 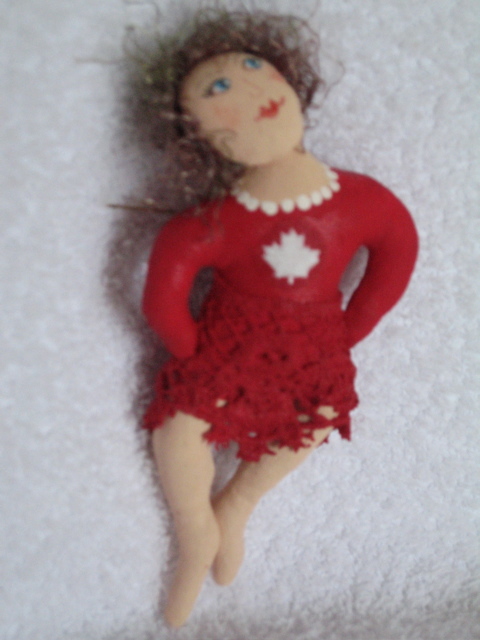 This doll represents the restless spirit of a doll maker who was sent off to the underworld without her stash. Without those materials so important to creating, she wanders the Earth each year in search of them. 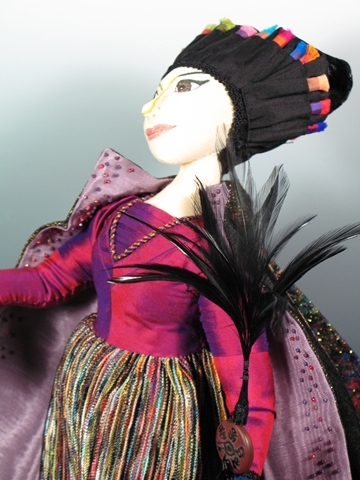 Elements of her costume, particularly the headdress and beading, represent the doll maker’s materials she is missing. She wears a short cape made of confetti cloth. She has the blue hands that appear in most of the illustrations of hungry ghosts that I have found. 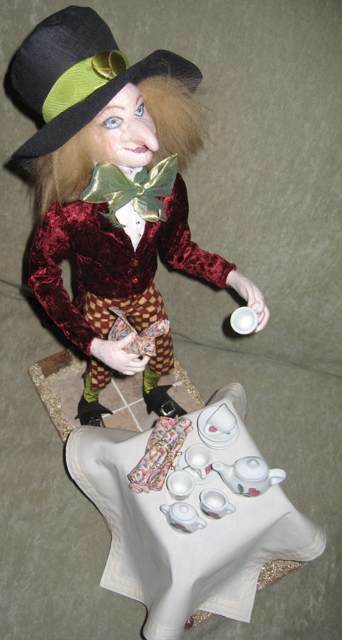 Round Robin Doll - Mad Hatter. Doll original design by Roberta Russell, dressed from waist to feet by Linda Potter; from neck to waist by Carol Ferguson; hat , hair and feet by Louise Bergeron, and accessories and display by Katuma McLaughlin. 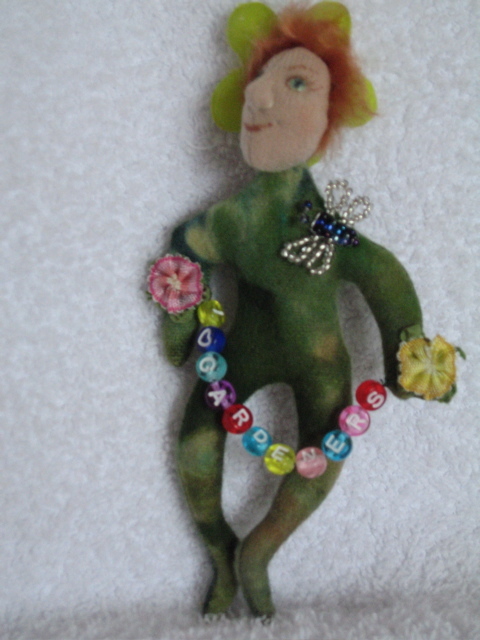 "Wee Woolies" pin dolls designed and made by Roberta Russell. All but the second one on the left are made of hand dyed wool fabric using various tie dye and overdyeing techniques. They are then beaded and/or embroidered. 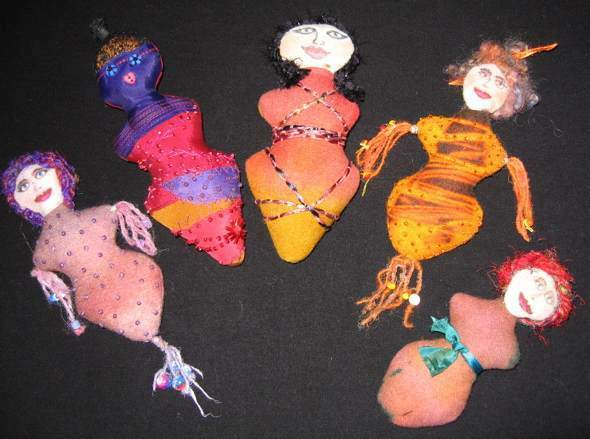 The second pin doll on the left is made of silk using a crazy quilt technique. 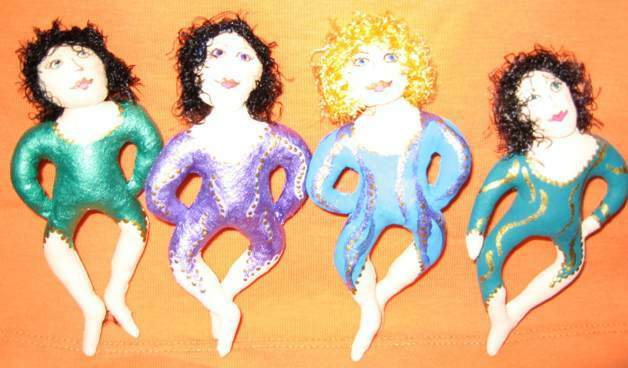 Dancer pin dolls designed and painted by Roberta Russell. 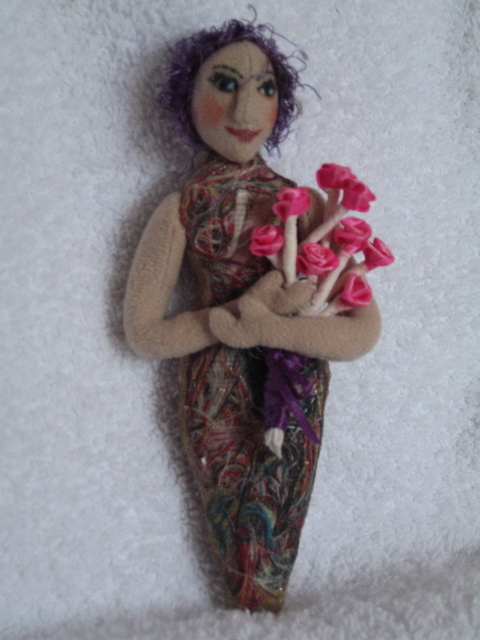 Fabric dolls with acrylic paint.